Michelle Branch said it best when she sang, "Goodbye to you, Goodbye to everything that I knew." Goodbye Take A Bite. It's been a stellar 5 years in this corner of the internet with you. Today is my last day posting at Take A Bite. It took some serious thought and something I have gone back and forth on, then back and forth again, but I'm finally at peace with my decision to close the door on my little food blog. I've loved sharing recipes, bites of my life and the occasional fashion inspo post, but after five years I'm saying goodbye to you. I hope you understand. I hope you enjoyed the past few years. I hope you were able to make a couple of my recipes. I hope you still come back and visit (the site isn't going anywhere despite my posting coming to a halt). I hope you still following my life happenings on social media. I hope you keep on taking bites. And I hope you aren't too distracted with all the Easter shenanigans to remember that it is also April 1st. Live from Oklahoma City, it's my new site design!!!!! Oh buddy this is a long time coming and I can't believe it finally happened. Isn't she lovely, isn't she wonderful? My sweet little DIY photoshop site I put together 2 years ago was in need of a little updating. Let's go through some new features and some of my favorite parts of the site. The Recipe Box feature in the right sidebar, so cute, right? All my recipes neatly categorized with themed pictures to organize them. The About page too, all my favorite things in one place. How great is the Instagram widget in the footer of the site? And finally make sure to subscribe via email (found in the right sidebar) to get Take A Bite sent straight to your inbox. I'm using a new service now that will make email posts look much prettier! Last summer I started doing research on switching from blogger to a new hosting site. I would do research then realized it was to hard, then a few months later I'd do it again and realize it was too hard, then so on and so on. With 400+ posts I wasn't about to put 2.5 years of work on the line with the easy chance I would mistakenly delete it all somehow in the process. This summer I did a little more research and found blogging guru Bobbi, and realized with her help, it wouldn't be so hard to switch from Blogger to Squarespace. After some consultation with Peyton and Madison and hearing how much they have loved their Squarespace site I knew it was time to take the plunge. Peyton and Madison are angels and took the ropes on all the design work. They took ideas I didn't even know I had and turned them into all of this! They are serious design angels. Huge kudos to Bobbi from Ready to Blog for taking all the techie ropes and peacefully transferring all my years of work to this beautiful new site. Ditto to Peyton and Madison for creating all design aspects and making the site look better than I could have wished, as well as to Peyton for being my Squarespace help center! She has an answer to all of my questions. I'm handing the ropes over to my foodie friend and sorority sister Noel today! She is a foodgrammer, loves to cook and like myself, obsesses over food. She makes me drool at everything she posts on her Instagram, so I asked her to come up with a recipe to share on Take A Bite! Hey guys, Noel here. I am a simple food lover. When I go to bed at night, I plan my breakfast. When I eat my breakfast, I plan my afternoon snack/ lunch. But I am thinking about my dinner ALL day. While I currently have no food blog, I have a daily struggle on whether to start one. You can, however, find me on Instagram--->@food_onmy_mind. I am 100%, without a doubt, keen for quinoa! I try to incorporate it into every meal, breakfast, lunch or dinner. When Annie asked me to do a guest post, I had no clue what recipe I would give her. But obviously I wanted to do something quinoa! However, a typical quinoa meal for me consists of cooking the quinoa separately and topping it with something or other. So I wanted to make something where the quinoa and whatever else I added to it was one, single entity. 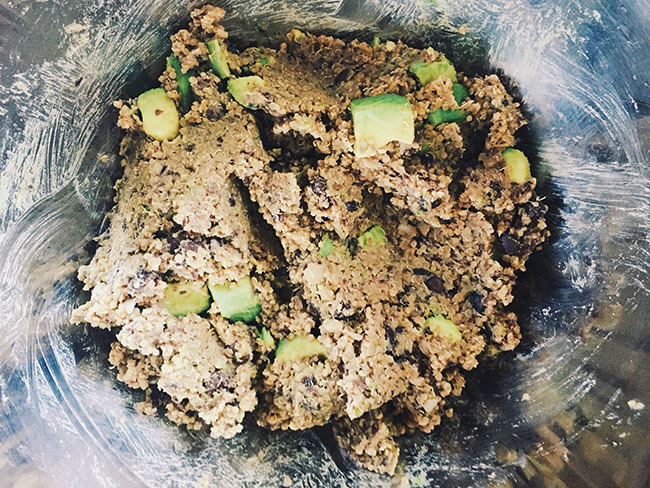 Annie and I tossed around ideas and we settled on Quinoa Avocado Black Bean Burgers! Yes, all that goodness was put into one, single (vegetarian) entity. 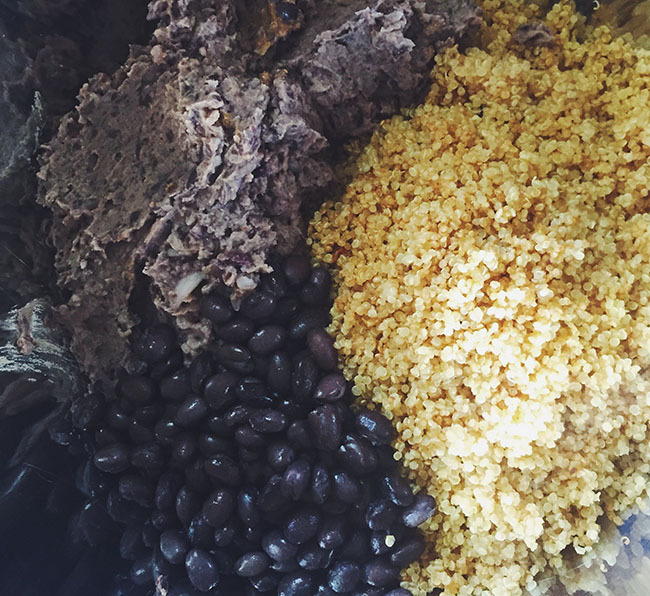 I had made black bean burgers before, and had never been successful so I was nervous to test these babies out. However, these particular BBB’s were made with special tender, love, and care (and I have since gained a food processor, which helped, A LOT). I invited a few friends to join me in taste testing and for the first time in my black bean burger career, I was successful. I did learn that my original recipe was a bit spicy (I love spicy as much as I love quinoa), so the one you’ll find below has been modified to a lower spice level. Now, I was really back and forth on what to put on my BBB. So naturally, I made two combinations of toppings and ate half of each burger. Burger 1: Dijon mustard, feta cheese, heirloom tomato, and alfalfa sprouts. 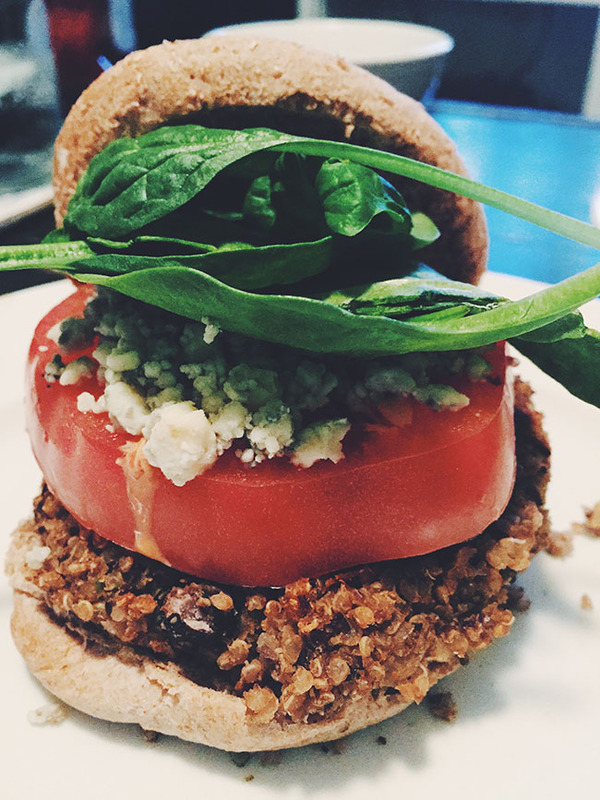 Burger 2: Spicy mayonnaise (homemade), blue cheese, heirloom tomato, and spinach. For those of you who are spice maniacs, like me, burger 2 is for you. It was spicy let me tell you! I will admit though, burger 1 was my favorite. The combination of feta and alfalfa sprouts with the BBB was mouth watering. I even made it into a salad the next night. Reserve 1/2 cup black beans and set aside. Add the remaining beans, shallot, spices, lime zest, juice and hot sauce into the bowl of a food processor, fit with a steel blade. Process until the mixture is the texture of a very chunky puree. Transfer this mixture to a mixing bowl. 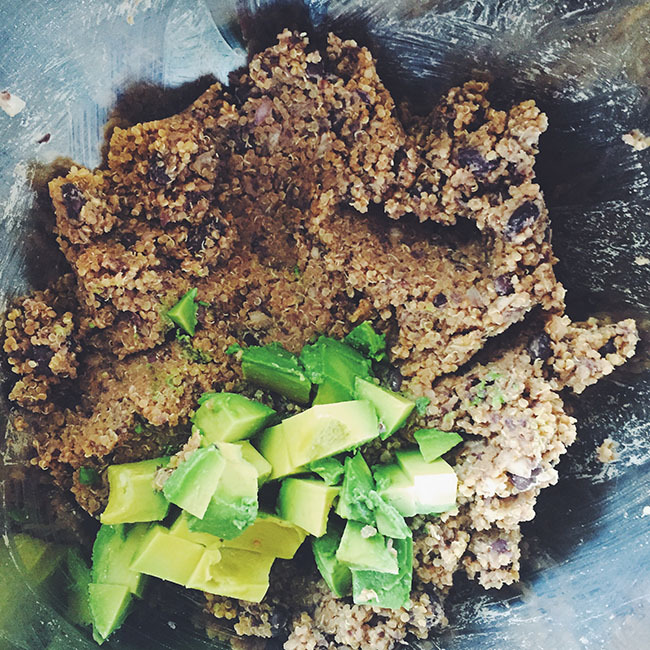 Add the remaining beans, avocado, cooked quinoa and egg white and stir together. (Turn so not to mush avocado) *If adding cilantro, do it at this step. Shape the mixture into 6 patties and chill in the fridge for at least 1/2 an hour, or more. Make sure patties are thin, so that they cook through. Heat a skillet over medium heat and add the patties to the pan. Cook them until browned, about 3-5 minutes per side. Serve on salad, with a bun and toppings, or in lettuce wraps/pocket bread.